An Anglican bishop has warned people will "undoubtedly" lose their jobs if the merger of three church dioceses in Yorkshire goes ahead. The plan would merge the dioceses of Ripon and Leeds, Bradford and Wakefield into a single one to cut running costs. The Right Reverend Stephen Platten, Bishop of Wakefield, said it meant job insecurity for a number of people. The Bishop of Ripon and Leeds, who supports the move, said there was no threat to people's employment. The Wakefield diocese has always expressed concerns about the proposal which was approved by the General Synod last week. Bishop Platten said: "This is going to make a number of people very insecure because there are undoubtedly going to be a lot of people who are going to lose their present jobs or at the very least will have to apply for another job in the new set-up. "Some of these jobs are very specialised jobs and therefore those people won't necessarily find it easy to get a job of the same sort outside the church." The Church of England believes the plan would help address issues of declining congregations, reduced numbers of clergy, weakened finances and rising pension costs in the three existing dioceses. The Right Reverend John Packer, Bishop of Ripon and Leeds, said over time the number of people employed would be reduced but there was no immediate risk of job losses. He added: "In terms of those who work in our diocesan offices they will continue to have posts if they wish to have them." 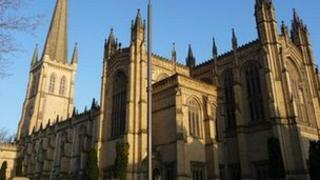 The new diocese, known as West Yorkshire and the Dales, could come into effect as early as 2014.